I’m all too familiar with the excuse for not forgiving. I can’t forgive because I’m right and “they” are wrong! It feels like it would be much easier to let go of hard feelings if the other party’s actions were something we could condone. It just seems to kill us to let go of our need to be right. Forgiving a humble and repentant offender is one thing but forgiving someone who doesn’t acknowledge any wrong and perhaps even continues it is quite another. We feel as if we would be letting the other party off the hook if we were to let go and truly forgive. Well…perhaps the opposite is true. Perhaps we would let ourselves off the hook! Freeing ourselves from the snare of bitterness, hate, fear, rage, obsession, revenge and judgment. 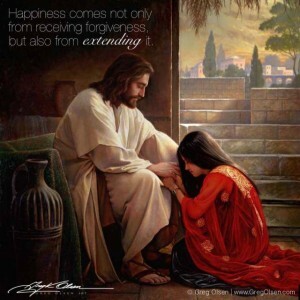 Forgiveness is for me – for us! Forgiveness heals and releases us from the torture of our negative projections which simply bounce back and fester in our own souls. Forgiveness is freedom. For the benefit of others as well as yourself, extend it! This painting speaks volumes to me. I love this. When i look at it ,it reminds me that He loves me and that I’m forgiven for all my mistakes. It’s Beautiful Greg. Everyone says when you see a painting, you will know which one is for you and this is the ONE. Beautiful tender mercies. You are so talented. you must have been a painter in the pre-life. truly gifted. In life we have ups and downs all the time, sometimes we go through very painful experiences, I had one such experience, I made a prayerful choice, which caused someone I love, to be very angry with me, for a very long time. I knew that I had done the right thing, but it still caused me a lot of pain. I could have been angry with this person, resentful, blaming, nasty, etc… But I chose to forgive, and love this person unconditionally. I gave him time, patience, and respect. Eventually he came to me, and said he was sorry, and that he loved me very much. This experience gave me the greatest lesson on unconditional love that I have ever had. The other great lesson that I learned is this, sometimes the people that hurt us, can become our greatest blessings, if we let them! We always have a choice in every situation, to either follow the light or the dark side! Not every situation is going to end this way, but if we follow the right we will always have Gods Blessings! I am and have been at the point this woman is at. My family & I have been at odds for about a year and I’m having to learn forgiveness from Christ. I feel just like this woman. Christ has been so gentle with me through all of the trouble. I would not know how to live now without Him and I wouldn’t want to try. Thank you for your art it truly touches my soul. My FAMILY …. brothers sisters nieces n nephew’s i pray for them to forgive n love each other again!! !